Hello my darlings! I have a super extra amazing delicious treat for you today: a new chocolate chip cookie recipe! These are the thickest chocolate chip cookies I think I've ever had! You can find some tantalizing photos of their beautiousness and the recipe over at The German Foodie! I'm so excited to guest post for Sofie today, you'll really love her! She's super smart, super sassy, and has gorgeous photos of the delicious (mostly German) dishes she shares. Another fun fact? She lives in a small Ohio town that neighbors the one I'm from-crazy coincidence! 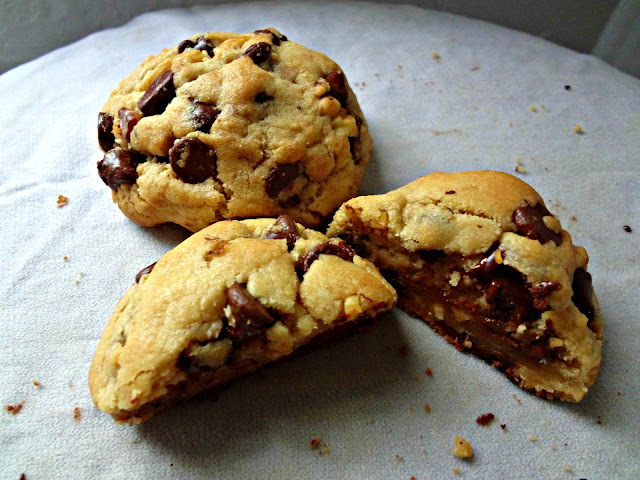 Anyway, head on over there now to find the recipe for Ultra Thick Chocolate Chip Cookies and stay awhile once you're there! Enjoy the awesomeness that is Sofie, The German Foodie :). Slightly adapted from Sugar Plum Blog's "Ultimate Chocolate Chip Cookies 2-All Butter Version"
In a medium bowl sift together flour and baking soda. Stir in the yeast, salt, and 1/4 cup cold, cut up butter. In the large bowl, on medium speed, beat together the browned butter with the sugars. (Once the browned butter has cooled enough) beat in the egg and vanilla into the sugar mixture. On low speed, mix dry ingredients into the wet. Chill dough in the refrigerator for at least 30 minutes. Preheat oven to 375 degrees. Grease a cookie sheet and drop 1/4 cup mounds of dough onto the sheet, leaving plenty of space in between. Bake 10-13 minutes, until golden. Allow to cool on the sheet for 2 minutes and then transfer to a rack to cool completely.